Is there anything more young(ish) than trying to make a meal out of happy hour? Gone are the days of pounding $3 rails on an empty stomach, I’m just looking for a nice cocktail and a date night that doesn’t break the bank. Luckily, there are a lot of quality happy hours in the city that fit those requirements and one of my faves is Ouzo Bay. 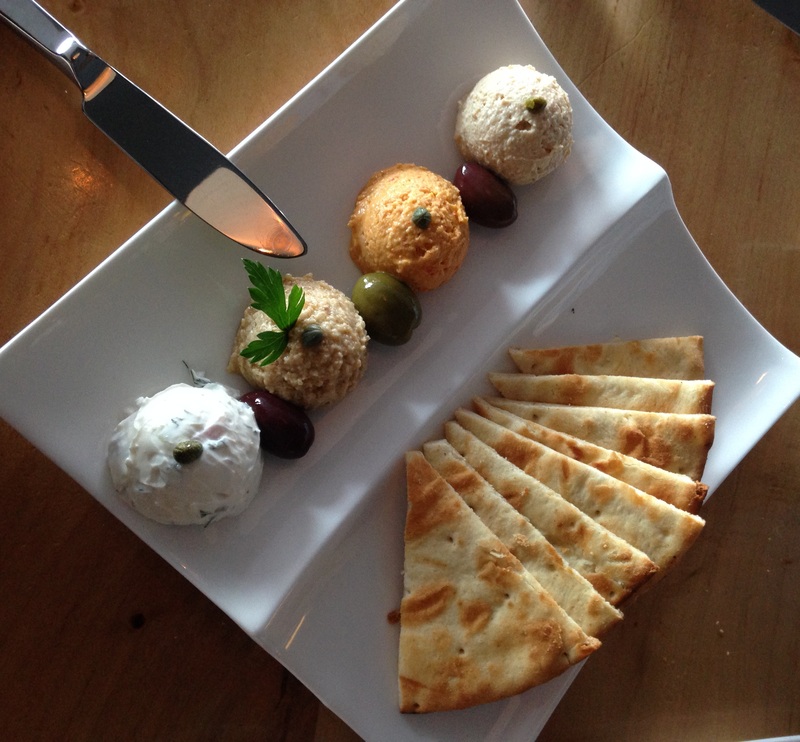 The upscale Greek restaurant in Harbor East has a large, open bar space and happy hour Monday-Friday from 4-7pm. With large windows and glass doors that open up onto outside seating, the whole place is airy and sunny on a summer evening. Bonus is that I can walk there from work downtown which is great since parking/traffic in Harbor East can be a little tricky around rush hour. 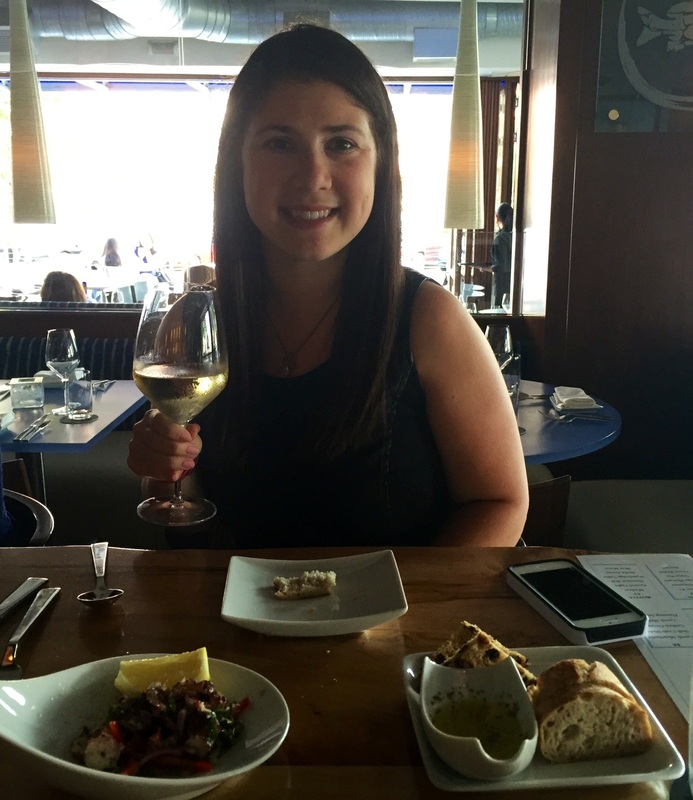 I met my husband for happy hour a few weeks ago and started with a glass of white wine while we pondered our food choices. 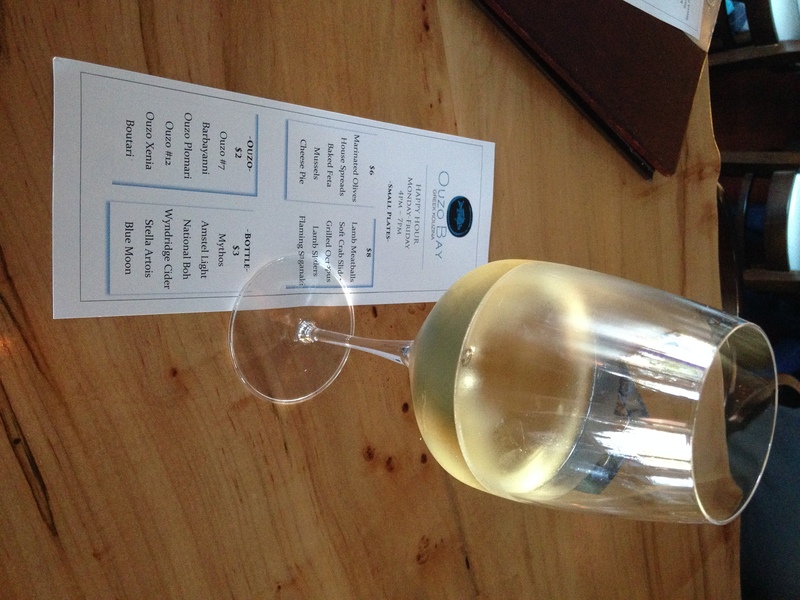 Ouzo Bay has a number of discounted small plates on their happy hour menu along with $3 bottled beers and reduced price wines and cocktails. 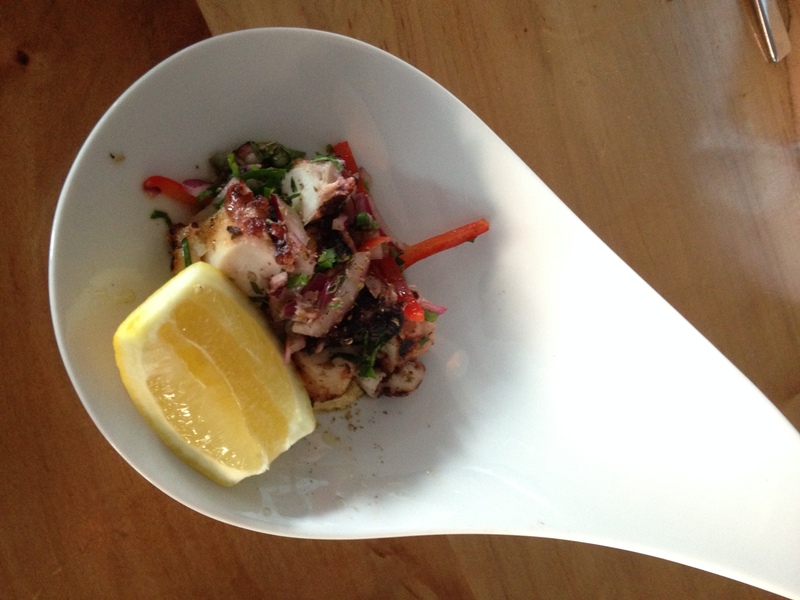 On past visits we had tried pretty much all of the small plates except for the house spreads so we decided to order that along with our favorite grilled octopus. The spreads were delicious and served with triangles of pita. There was a fish spread, a red pepper and feta spread, a tzatziki spread , and some sort of nut spread that I blocked out because I’m allergic. While we waited for our apps we munched on a delicious bread basket because the more carbs the better amirite? After our first set of munchies we ordered a second round of drinks and that’s when we decided to go big or go home. We were both still a little hungry but couldn’t agree on a dish to order so we got the soft crab sliders and the lamb sliders. In retrospect, probably not necessary but they were both delicious. 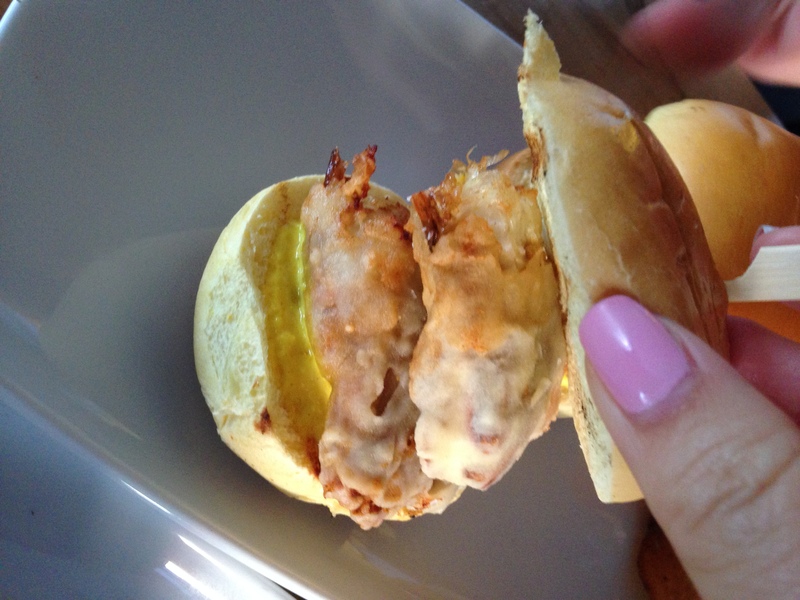 Each dish had two of the sliders served alongside homemade potato chips – you could probably make a meal from one of these alone, but where’s the fun in that? Our bill ended up being less than $70 including tip though we could have definitely saved money and still had a great experience if we had ordered less food and had beer instead of wine. If you’re looking to get a little happy hour action into your hump day check out Drink Baltimore’s list of tonight’s happy hour specials!